It was 1980 in the middle of the Cold war. American State department, initiated US Olympic committee and several National Olympic committees, took the decision to boycott the Moscow Olympics because of the fact that a year before Soviet arms forces entered in Afghanistan. 1983 fall — Soviet fighter brings a South Korean passenger airliner “Boing-747” in the Far East. Our media accused the Occident of provocations and spy’s activity, and American president Ronald Ragan named USSR “Imperia of Evil”. It seems that this confrontation was at apogee. But in 1952, at once after Korean War, and in 1960th in a period of Caribbean and other crises, an idea of boycott Olympic Games never was backed in USSR, as well in USA. So way in this case Soviet authorities decided in replay of American boycott of Moscow Games by such radical manner? Between others exists a sporting apparatchik’s version. According to declaration of Vitaly Smirnov, long-term President of Soviet and then of Russian Olympic Committee, a member of International Olympic Committee, in this tense situation an unseemly role was plaid by Marat Gramov, being at this time a chairman of Soviet Sports’ committee. In the beginning of 1984 delegation of Sports’ committee visited USA, acquainted with Olympic sites in Los Angeles, chose a campus for Soviet team in Olympic village. Everything was developing under plans of preparation to main competitions of four-year period. But Summer Games-84 took place after Winter Olympics in Sarajevo, where we lost them to Eastern Germans. It was a total flop! Gramov looked awful. He clearly understood, that a second failure in a row (general first place in Los Angeles was unreal for us) would cost him his big post. Gramov’s anxiety was shared by his comrades in Central committee of Soviet Communist party. Finally, when was appeared a memo, signed by Soviet minister of foreign affairs, a Politburo’s member Andrey Gromyko, Mr. “Net”(No in Russian, like that he was nicknamed in the Occident), concerning an impossibility of USSR’s participation in Summer Olympic Games-84, it was unanimously accepted by all highest state and party’s circles of Soviet Union. Memories of Vladimir Salnikov, double winner of “Friendship-84”, regarding those events are the following. 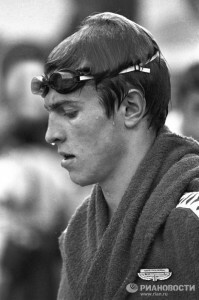 Vladimir SALNIKOV born on the 21th May 1960 in Leningrad (USSR), 4 times Olympic champion, many times World, Europe and USSR champion and records holder of World, Europe and USSR in 400, 800 & 1500 m freestyle. Honoured Sports Master of USSR. Graduated from Swim club “Ecran” (Leningrad). Coach: Igor Mikchailovich Koshkin. From February 2010 President of Russian Swimming Federation. — I received this disgusting news being in a training campus of East Germans in Lindorfmark. The news was really killing. It was like to tug emergency break of rapid train on the move. This year I was a records-holder in all middle and long distances in crawl, I was in a great shape. A very difficult training work strayed behind… And they prosed us instead of Olympic races in Los Angeles so called “Friendship” competitions in Moscow. Yes, of course with all necessary decorations and bonus of Olympic level, but were they really an alternative substitute? This summer was circulating a certain proclamation on behalf of Soviet sportsmen about their indisposition to participate in the Olympic Games in USA, but I categorically refused to sign this paper. I was hold in swimming till Olympics in Seoul only by the fact that the results of swimmers in Los Angeles were poor than mine, and my personal Olympic thrift box was not enriched. That’s way me with Marina (wife and personal coach of Salnikov in 1985-1988), we decided to work hard more four years in order to prove to everybody, that I was the best in the World. But the results of “Friendship-84” were really on the top World level. So, a new Planet record of Serguei Zabolotnov in 200 m backstroke was much better than the gold result of Olympic champion, American Rick Kairi. East German Sylvia Gerash became a best breaststroke swimmer of the season with a World record in 100 m, and Inna Kleber set up a World record in 100 m backstroke. More 2 World records were established by Eastern German teams in relays 4×100 medley and freestyle. One Europe record was shattered by Tatiana Kournikova in 100 m butterfly and 2 others by our boys in relays 4×100 m freestyle and 4×100 m medley. Serguei Smiriaguin and Alexey Markovsky thrice celebrated their Victory day, twice — Dmitry Volkov, Robertas Zhulpa, Vladimir Shemetov, Serguei Zabolotnov, Alexander Prigoda, Serguei Kurbatov. Also champions of “Friendship-84” became Serguei Krasuk, Gennady Prigoda, Larisa Belokon’, Tatiana Kournikova, as well as rising star of Soviet swimming Elena Dendeberova.